As Facebook moves to privilege “broadly trusted” sources in its News Feed, Reuters Institute for the Study of Journalism research shows that broadcasters and newspapers are more trusted than digital-born outlets across a number of countries. By Antonis Kalogeropoulos and Richard Fletcher June 13, 2018, 7:01 p.m.
As Facebook moves to privilege “broadly trusted” sources in its News Feed, our research — more of which you’ll find in this year’s Reuters Digital News Report — shows that broadcasters and newspapers are more trusted than digital-born outlets across a number of countries. Earlier this year, Facebook announced that it would prioritize news from brands that its users perceive as trustworthy, as part of a response to allegations related to the spread of misinformation on the platform. 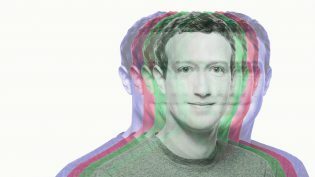 “As part of our ongoing quality surveys, we will now ask people whether they’re familiar with a news source and, if so, whether they trust that source,” Mark Zuckerberg wrote. Facebook measures news brand trust by asking its users if they have heard of a news brand and then to rate it as trustworthy from 1 (entirely) to 5 (not at all). 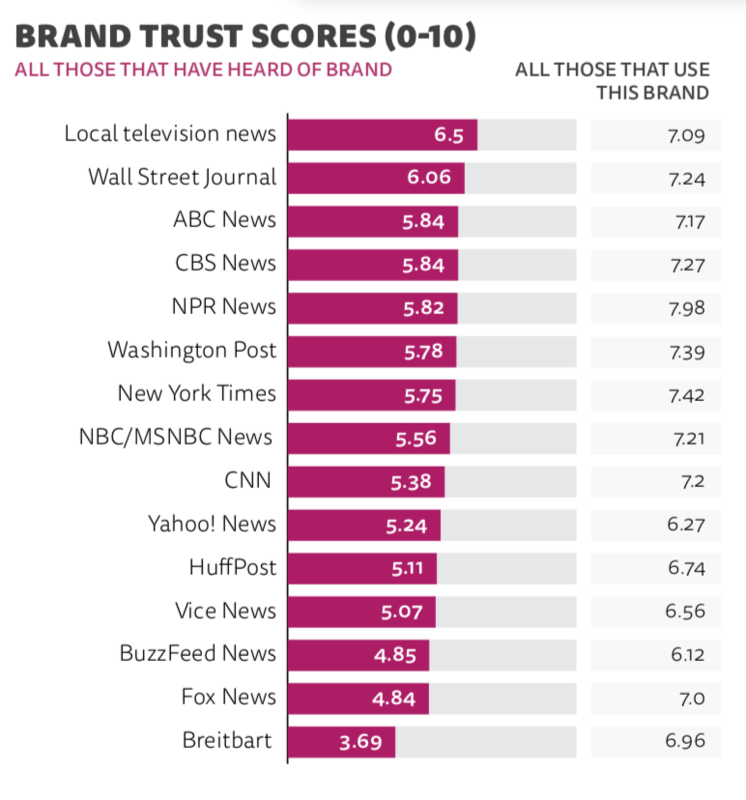 In our survey, people were asked to rate a number of the most popular news brands from 0 (not at all trustworthy) to 10 (completely trustworthy). They could also respond that they had never heard of the news brand. The data presented here represents the views of the online population of each country (unlikely to differ significantly from the views of Facebook users). 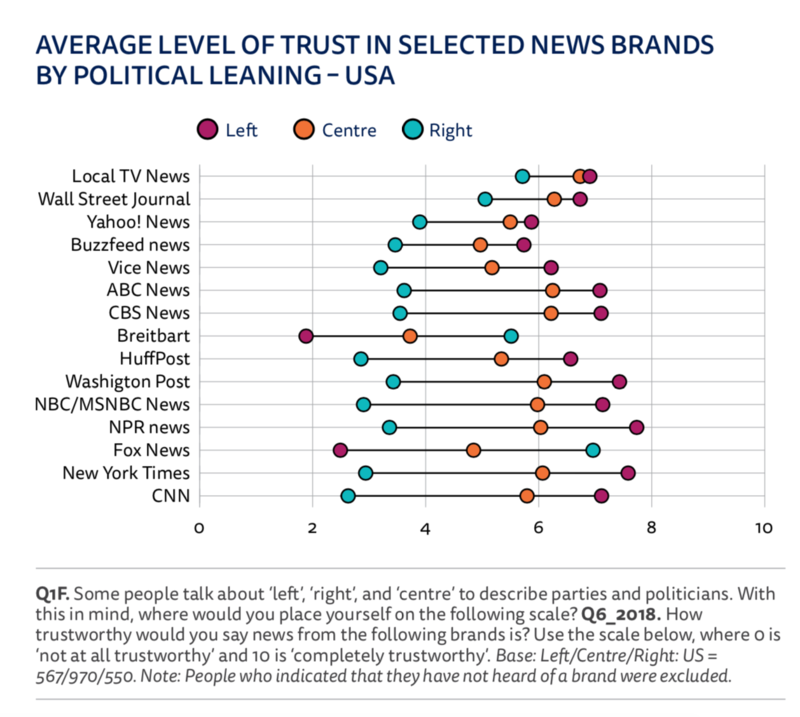 In the U.S., we can see that people tend to place more trust in mainstream, legacy news brands. Digital-born and/or partisan sources are trusted less. The users of each brand tended to trust it more than the general population, but particularly so for more right-leaning brands like Fox News and Breitbart. Across a number of countries, we see that TV brands and newspapers score higher levels on trust on average than digital-born news brands. In addition, we find that Public Service Broadcasters (such as the BBC in the UK) are more trusted in cases where they are perceived as being more independent from the government. There are some exceptions to this pattern. In Hungary, a country with low levels of trust in news, digital-born outlets are as trusted as legacy outlets. Digital born brands also do well for trust in Spain, where journalist led start ups have become a feature of the media landscape. In many instances, we see large differences between people on the left and the right in terms of how trustworthy they think news brands are. Overall, most mainstream news brands in the U.S. are trusted more by those who self-identify on the left of the political spectrum, while those on the right tend to be much more skeptical of news organizations, with the exception of right-leaning outlets such as Fox News and Breitbart. The differences were very large for outlets like CNN (7.08 score for left-wing individuals and 2.4 for right-wing individuals), The New York Times (7.55 for those on the left, 3.04 for those on the right), and Fox News (2.44 for those on the left, 6.94 for those on the right). Broad trust is rare in the U.S. These rather striking differences could be a reflection of President Trump’s narrative about the mainstream media. It’s noticeable that outlets with the largest gaps in trust between left- and right-wing partisans (The New York Times and CNN) are those frequently attacked by the president himself. Though people have conventional views about what news outlets are trustworthy in the aggregate, it’s also clear that views can diverge greatly when we consider specific groups. But not every country is as polarized as the U.S. 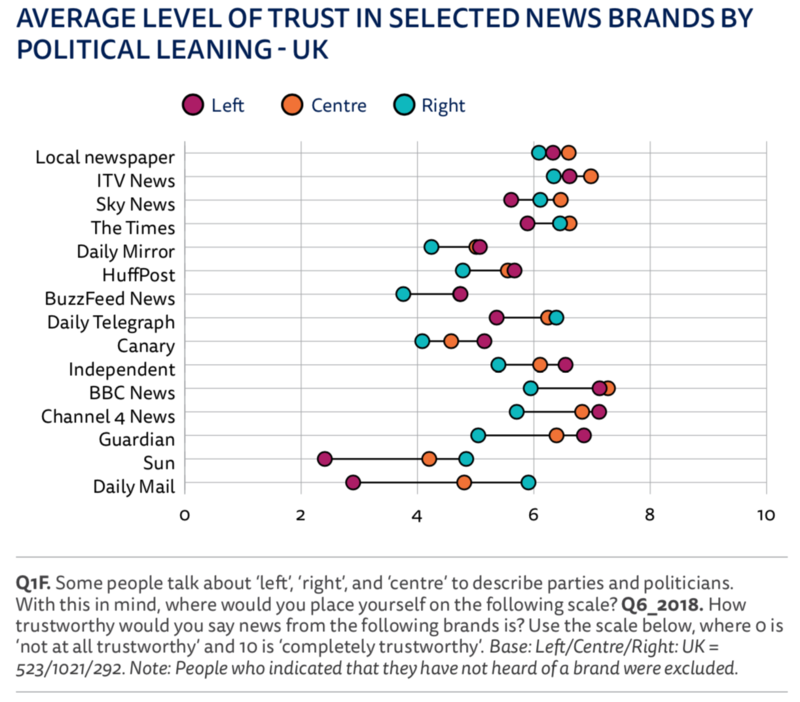 When looking at brand trust based on political leaning in the U.K., we can see that the gaps are much smaller. This is perhaps surprising given that in the U.K. most print outlets align themselves to the left or the right, unlike the U.S. where the “objectivity norm” has been dominant. 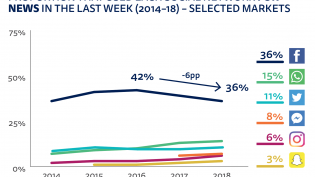 We do see some large differences in the U.K. for the right-wing leaning tabloids, such as The Sun and Daily Mail, which tend to be more trusted by right-wing identifiers. But perceptions of quality also seem to matter. The Times and the Telegraph, which are both considered to be right-leaning, also enjoy a relatively high degree of trust from those on the left. Brand trust scores will be particularly important this year when Facebook will use similar metrics (alongside other signals) to prioritize news from some outlets over others. These algorithm changes have already been made in the U.S., but have still to be rolled out elsewhere. 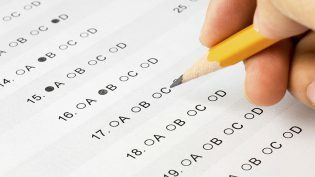 We may never get to see Facebook’s scores, and it’s still possible that they will differ from those presented here, either because of the methodology used or because their sample is different. However, if scores similar to these were to be factored in to Facebook’s algorithms, traditional, non-partisan brands would be most likely to benefit from this change to the News Feed ranking algorithm. The news brand trust scores for the most popular news brands of all 37 countries of our survey sample are available here. and Richard Fletcher, Antonis Kalogeropoulos. "In the U.S., the left trusts the mainstream media more than the right, and the gap is growing." Nieman Journalism Lab. Nieman Foundation for Journalism at Harvard, 13 Jun. 2018. Web. 23 Apr. 2019.
and Richard Fletcher, Antonis Kalogeropoulos. "In the U.S., the left trusts the mainstream media more than the right, and the gap is growing." Nieman Journalism Lab. Last modified June 13, 2018. 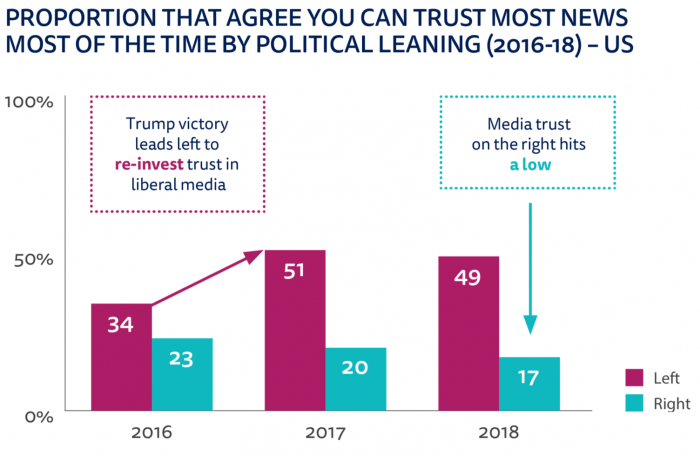 Accessed April 23, 2019. https://www.niemanlab.org/2018/06/in-the-u-s-the-left-trusts-the-mainstream-media-more-than-the-right-and-the-gap-is-growing/.